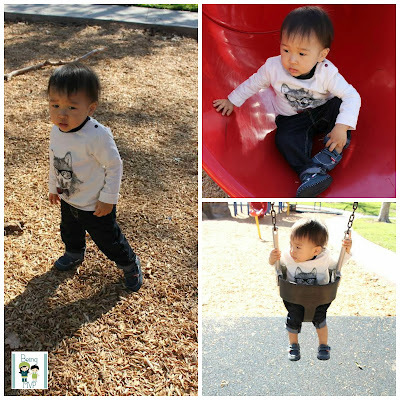 I adore the unique styles of Mamas & Papas clothing so when I found out that they were carrying larger sizes, I definitely wanted to get my tots styling for Fall. The outfits that arrived for review are perfect for play and pose. Kenzie is wearing the Girls Blue Spot Dress ($42.99) and Mason is wearing the Boys Wolf Long Sleeve Tee ($19.99) with Boys Dark Wash Jeans ($19.99). This wolf tee is one of my favorites. The whimsical sketch of the friendly wolf sporting spectacles and a dapper bow is perfect for the fall season. The cotton is super soft and Mason looks oh so adorable in it. Paired with the classic dark wash jeans makes it ready for play while mama can snap pics. He is wearing size 18m-2T which is great because you can get longer wear with the adjustable waistband and folding up the sleeves a bit. After washing, the colors stay true and the fabric remains soft. Love, love this outfit. Kenzie has been requesting to wear dresses more recently and absolutely enjoys wearing the Mamas & Papas blue spot dress. She is wearing size 4 which is perfect to layer when chilly outside and to wear alone once Spring weather hits. The fluttery nature of the design makes it easy to play in while still looking dressy. The pop of orange against the blue pattern is amazing. 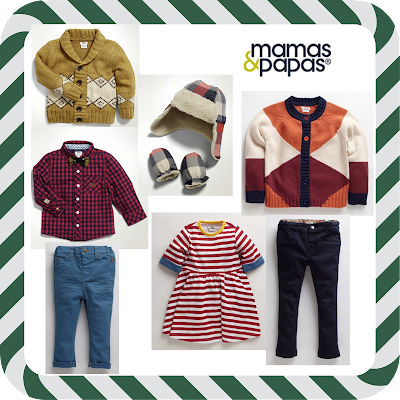 Mamas & Papas clothing collection is very reasonably priced for the quality of clothing you are receiving and the design and detail just scream well made. It's nice to mix and match for your mini fashionista in the Mamas & Papas pieces. What are some of your favorite pieces? Check out some of my favorites that I would love for Mason and Kenzie to wear. omg the outfits are so adorable i esp love what mason is wearing! i did not know they made clothes! Very stylish clothing!! I love Mason's shirt! And the winter hat and mittens pictured above are adorable! Love the clothing! i wonder if you can only buy them online! Super cute!